The majority of product produced by the Newnes Junction Project will be Construction Sand, comprising 80.2% of total output. Click here to see the Construction Sand Product Snapshot. Silica (SiO2) is one of the most abundant minerals in the earth's crust. Its most common mode of occurrence is in modern sedimentary environments, e.g. rivers, beaches and dunes, or in ancient environments preserved as sandstones. Silica sand is one of the main ingredients in concrete, in which it is a low-value material. Any physically strong and unreactive sand can be used as a fine aggregate when making concrete, its particle size constituting the most important parameter. Silica also has many medium and high value applications derived from its inertness and physical properties. These refined by-products of sand extraction are dealt with in the section on Specialty Sands. World consumption of silica sand in the construction industry is very large, around a thousand million tonnes per year. Consumption of silica sand in other applications is around 100 million tonnes per year. 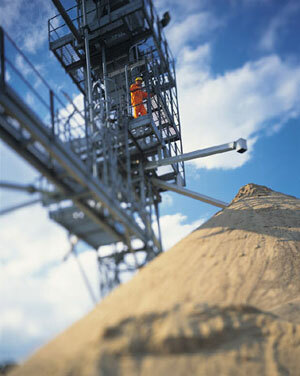 Demand for construction sand from the Sydney Metropolitan area in 1999/2000 was 6.73Mt. Unconfirmed reports from the Department of Infrastructure, Planning, and Natural Resources (DIPNR) claim that sand production for Sydney in 2003 exceeded 7Mt. It is estimated that more than 57% of this figure was supplied to just two market segments - the manufacturers of ready mixed concrete (49.4%) and concrete products (7.7%). The bulk of sand consumed by ready mixed concrete manufacturers (<5mm fine aggregate) comprised coarse river sand blended with fine dune sand, sourced at Penrith Lakes and Kurnell respectively. At the end of the 1999/2000 financial year, more than 19% of the 'natural' sand consumed by Sydney's construction industry had to be imported from outside the region. Thus, the industry had to import more than 1 million tonnes of 'natural' sands despite the substantial growth in the availability of alternatives, including so-called manufactured sands (hard rock crusher dust), recycled concrete and brick sands, slag sands, and crushed sandstone. The main causes of sand shortages are the rejection of a proposal to increase sand extraction at Kurnell, following strong Council and public opposition to the DA and EIS lodged by Rocla, and the final depletion of sand supplies out of Penrith Lakes by 2010/11. The exhaustion of quarriable reserves at these two locations will decrease Sydney production by about 1 Mtpa and 2-8 Mtpa respectively. After about 2011/12, the only major existing source of supply remaining in the Sydney Metropolitan area will be Maroota where a range of environmental and safety issues are expected to see annual supply capped at something in the order of 0.75 Mtpa. Alternative sources of replacement sand supplies from the Richmond Lowlands, offshore marine aggregate sand, Stockton Bight, and Somersby Plateau are all areas that will attract substantial opposition from the local Councils, population groups, environmental groups, and others. Shortages of construction sands are (and will continue to be), partially met by supply of alternative 'fine aggregate' materials, particularly hard rock crusher dust and recycled concrete and brick. These materials will continue to be used in considerable volume at the lower quality end of the market. They will be principally used as fill materials and as a blending medium in the manufacture of road pavement materials, asphalt fines etc. Most of these alternative materials are finite in supply and variable in quality. Crusher dust will need to be imported into the Sydney Metropolitan area from hard rock quarries located on the Central Coast, Southern Highlands, the Illawarra, and the Blue Mountains. Demand will be for a fully graded, well-shaped, strong, durable, clean, chemically inert sand, free from deleterious materials. There is no currently operating source of fully graded, premium quality, construction sand in the Sydney Metropolitan area. "The Sydney region currently faces a shortage of fine, medium and coarse graded construction sands. The shortage of sand is expected to become critical by the end of the 20th century as existing sources are depleted. The high quality and immense size of the sand resources of the Newnes Plateau could lead to development of the area as the major source of supply to the Sydney region into the 21st century." The Project area, the subject of SCM's Development Application, contains in excess of 21Mt of fully graded, premium quality sand product after extraction and processing. It can be confidently forecast that the fully graded sand product will be at least the equivalent of any existing, blended sand product. Long term sales opportunities for the sale of SCM sand can be confidently forecast to be in excess of 1.1Mtpa as a part replacement for forecast shortages of 1.6Mtpa after 2005/06, to 5.95Mtpa by 2019/20. Newnes Junction sand will be in demand on the basis of its long-term availability, quality (particularly grading), and delivered price into Sydney markets. In this report, probable-case sales opportunities growing from about 0.3Mtpa by 2006/07, to 1.1Mtpa from 2011/12 have been forecast. Long term forecasts translate to SCM capturing 14-15% of a total market supply and 20-21% of supply to ready mixed and other concrete manufacturers. The key factors in achieving forecast market penetration will be product quality and price. Fully graded, premium quality, concrete sand will need to be delivered into Sydney batch plants for AUD30-32 per tonne (AUD24-26/t ex-bin). •	The use of all the material in the friable sandstone deposit in addition to construction sand.